Despite direct and clear orders from Pakistan Telecommunication Authority, Mobilink has announced the next round of SMS Khazana – dubbed as Jazz SMS Khazana 8, an SMS based trivia quiz that can win customers prizes. 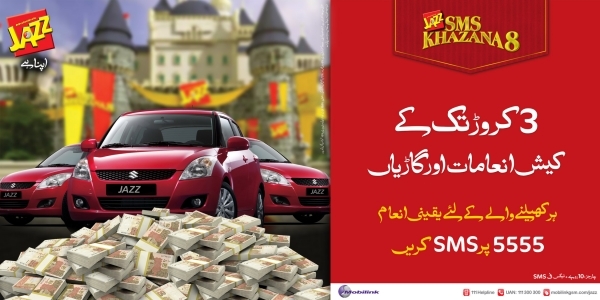 Mobilink claims that this would be biggest ever SMS Khazana promising lots of grand prizes for Mobilink customers! Like before, Jazz SMS Khazana 8 is based on customers answering trivia questions to enter a lucky draw to win daily and weekly prizes, as well as a grand bumper prize! The more questions a customer answers, the greater the chances to win a prize. Going one step further in rewarding our customers, the total prizes for SMS Khazana 8 equal a staggering Rs. 3 crore! and a bumper prize of Rs.5,000,000! And that’s not all. Every correct answer wins you 5 free Mobilink minutes and 20 free SMS and even every wrong answer wins you 5 free SMS! Ohh bhai kaun sa PTA aur yeh sub fraud hai laiken hum pakistani is umeed par bethay hai kay inaam niklay ga.
very good step by jazz SMS thank you. I didn’t even subscribe to this absurd trivia quiz and Mobilink bombards me with at least 10 messages everyday. Allah Pak aur Allah ka Rasool pak(PBUH) hi behter janty hai ke kya sahi hai kya ghalat hai? I play on 24 Aug and spend Rs. 200.00. When you will announce the result? I think I have lost Rs. 200.00. All is fraud. ye sub kuch fraud ha. Maine 2108000 point hain or har din top 1% players main tha lekin wohi fraud preselected logon ko inam milta ha chahay aap 1 karor points lay lain. Yeh ketay hain k is main lucky draw hota ha or koi bhe inam jeet sakta jis ne sms kiya ho lekin aik haqeqat aap ko bataoon, agar aap sms ka khazanna 7 k or sms khazzana 8 k winner dekhain tu aap ko bohat saray name duplicate milain gey. Maie Haja jin k talaq shaid Ghotki se ha us ne scheme 7 mein 3 martaba bara prize geta ha jabkay sms khazanna 8 mein doo (2) martaba winner ha (including grand prize as well). hairat key baat ha k Maei Hajan k pass super lucky number ha jo har martaba ik grand prize lucky draw k zariyee jetty hain. Maei Hajan ka ID card number wohi ha jo scheme 7 or 8 main ha. Ik jaga per fraud ka patta chalta ha, scheme 7 main ik jaga per Ghotki key jaga Sakkhar likha ha. Maine Daily Pakistan ko sub information de dein hain or wo is per investigation ker rahay hain. Maine PTA ko bhe mail k lekin bekar…..!!!!! Good research Mr. Love Pakistan…. Aik Altaf Ahmad bhi in ka relative hey check his name and details in sms khazana 7 and 8 too. AOA, Friends, this all above is fraud by Mobilink. They have not been updated even bumper prize winner name. They have been known that people of Pakistan would easily made fool. G Shahbaz sb! SUZUKI SWIFT…………………………………….? hello plz zara jaldi karo may new car k wait kar raha hun. may aj top 1 player hun es leye i hope ap car ke news mughay bhoat jald de rahay hain. hello plz zara jaldi karo may new car ka wait kar raha hun. aj apney sarey payse es joway per lagga deye hain. it is good contest. but question should be difficult. haan yaar yeh sab jhoot hai mai khod aik student hon aur apni saaari pocket money es fraud game pe laga chuka hon mere 318,875 points hai leken koch nahi jeeta. Etni big company ko es tarah ke fraud nahi karni chaiye bare sharam kee baat he. O brother , please mahnat karo, in shortcuts may na paro..You are wasting your money..PTA must stop them..
Ab service shoes , Mahran garam masala, walay bhi shuru hogay…. Yar ab bhi ham in kay peechay lagay rahain..meri to thek that pocket khali ki inho nay..
Altaf, Zahid Iqbal, Maei Hajan ye sub winner hain jazz sms scheme 7 aor 8 k. Mainay jazz customer service per is ko discuss kiya lekin woh apni company ko har martaba defend kartay hain or kehtay hain k ye fair aor transparent ha. Lekin aap sub log jantay ho k ye fraud ha. Mainay unko request ke k meri email ko higher official jo is scheme mein directly involve nahi hain unko forward karein. Ab pata nahi k inho ne forward key ha ya nahi. Meray khyal mein hum logo ko is fraud ko facebook ya dosray social media per bhe discuss karna chaheye ta k dosray log bhe ye jan saken aor Jazz ke ye scheme fail hojayee. I can go to court but will need some help from NADRA as I might need the full ID card numbers of these winners and hence we can fiqure out the fraud. But I am not sure whether or not NADRA will provide information. Today I have sent am email provided with all evidence/proof to FIA as well. have a look onto the winner list updated by jazz sms ka khazzana 8………so funny all the prizes were won by Ghotki peoples even some are looking to belong to same family…just check the names and it clearly voilate jazz claim that the winners are selected on the basis of lucky draw……Ghotki peoples are so lucky that they have won all mega prizes. I AM HAVING ABOUT4100000 UP TILL NOW AND STLL RYINHAIG THE CELL COMPANY HAV DISTRBUTED 3 CARS AND THESE CAR WERE IN GHOTKI. KIA YEH SUCH HAI. GHOOT BILKUL GHOOT. AUR KIA BATAOOOOO. This time in Jazz Sms khazana 8 most of the winners are from Ghotki and now the Admins have removed the city column.They at Mobilink are committing a fraud and all us are becoming a part of this fraud……Feel sorry for myself and all the others who play.Because every Khazana sms i have played but never won a single penny in these 2 n half years…….Fake winners,,,Fake results ,,Fake campaign..
lets protest against Mobilink….just imagin…the company is earning billions of rupees coz of this scheme and loooting people from both hands….i think prize list is fake they just copy paste on excel sheet that s y they r from ghotgi…secondly there is also repeated names in list….as per policy a person cant win two prizes…..we need to protest and report PTA and shut this…..Mobilink must involve media and make a draw in front of public and Media…it must prove that all the prizes are real otherwise it does not have any right to play with the public……….Would u protest? know IQBAL is come !